Sculptures, murals and statues are dotted around Auckland with information about many of these public artworks available on Auckland Council’s Art and Heritage Database. A display on level 2 at the Central Library showcases some of these items, from Fatu Feu’u’s Aotea Centre mural to Greer Twiss’s Pigeon Park sculpture. 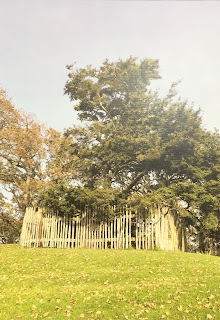 Statues and monuments from the Auckland Domain are featured including the Pukekaroa Palisade where Princess Te Puea planted a tōtara tree during the city’s 1940 centennial celebrations in order to reaffirm the mana of the Tainui people in the area, and the connection between her family and the Domain. 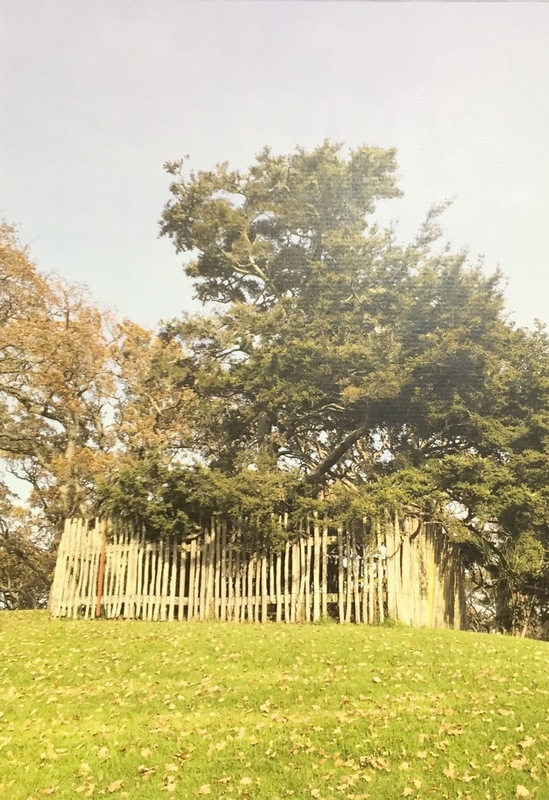 Her great-grandfather Te Wherowhero had lived in two houses on the Domain site between 1847-1858 before returning to the Waikato as the Māori King. Another artwork gifted to the city during the centennial was the ‘Tableau of Three Muses’ near the Domain’s duck ponds. The Muses represent Wisdom, Fertility, and Auckland’s growing strength – but Paranormal New Zealand finds they also recall the story of three witches reportedly hung in the 1800s from trees in the swampy land that became the Domain, of whom there have been many reported sightings. Claudia Pond Eyley and Jan Morrison created the bright Women’s Suffrage mural in Khartoum Place to commemorate the centenary of NZ women gaining the vote in 1893. However, only 12 years later a local businessman described the mural as belonging “in a 1970s craft shop.” Thanks to public support, this mural has survived two sustained attempts to have it removed – including a proposal to resite it next to the White House brothel at the entrance to Myers Park. It is now protected in perpetuity as a national treasure. Ref: Russell Street, Kaitiaki, 25 January 2010, CC BY-SA 2.0. Fred Graham is known for many sculptures around the city depicting birds. 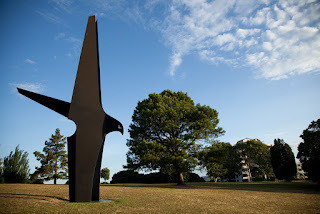 Three appear on the database including the 11.8 metre high ‘Kaitiaki’ (Guardian) silhouette of a hawk in flight at the Domain, and the ‘Walsh Brothers Memorial’ - a titanium bird suspended six metres above Mission Bay’s Selwyn Reserve. One of the country’s most highly respected abstract artists, Milan Mrkusich, designed several public artworks in Auckland in the 1950s-60s including the mosaic mural on the B. J. Ball Building overlooking Fanshawe Street. This is made from thousands of glass and ceramic tiles, and in 1997 the Historic Places Trust notified a plan to give the building a category one listing on the historic places register partly because of the mural’s artistic significance. Fatu Feu’u commemorates people from Samoa, Niue, Tonga and other islands of central Polynesia who migrated to NZ and made their home in Auckland Tāmaki Makaurau in his mural ‘Tautai Matagofie’ (Wonderful Navigator) installed on the fourth floor of the Aotea Centre. 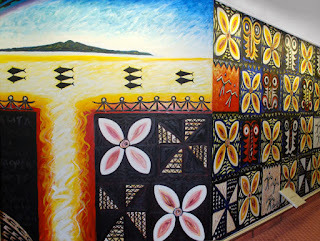 The 32-square metre mural begins in the east with the moai, an Easter Island sculpture; moves through central Polynesia with motifs such as siapo (tapa cloth) and Lapita (pre-Polynesian pottery); and concludes at the end of the rainbow where a koru symbolises the Waitematā Harbour.